numpang neydot kang yaa...trims sebelumnya..
kang cebong, kira2 nih template support ke IE,opera,crhome, opera.. nggak yah..? Parabens pelo excelente BLOG, serei visitante assiduo. Mas maaf bangrt nih nyeleneh & gak nyambung... Kalo boleh tau dan boleh nyaranin buat postingan nanti, beritahu donk caranya bikin social bookmark kayak diatas ... tu yang ada di bawah postingan .. Hee..he,,..
@7gadget: ooo yg ada efek kaya animasinya itu yah? iya nanti saya posting ya..
mbak aku pake yah buat blog aku yang satunya ^^ oiya mbak kalo yang template ini udah ada automatic thumbnail nya? jadi tinggal upload aja gambarnya? haha iya mbak terus upload nya ke mana maksudnya?? Really like this layout! But is it possible to remove the 'continue reading' button so that the whole entry can be seen? Hope you'll reply! However, when I set my navigation menu instead of opening the link in the same page it opens a whole new page or web browser. mba cebong, aku termasuk salah satu fans template mu. tapi gini, bolak balik aku tempel template mu di blog ku kok side bar nya malah nggeser ke bawah yo? piye iku? I have one question regarding the post summary. Is it possible to control where it cuts the blog post? Thank you for this amazing template! But how can I remove the code that generates the categories and archives of the blog? I'm afraid to try to remove the code and end up missing ..
Hi i like this templete so much, but can i remove the advertisement column or delete it? hi i'm having problem synchronizing this template with my jskit echo's commenting system. can anyone help? thx! I love the template but, have a problem with commenting and date. I used to see the pink-blue bar near the headline of the post. But now, ıt doesnt seem. This template is so cute! I love it! How I change the background color? 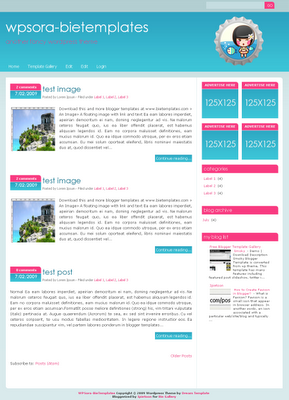 www.itemplatez.com web templates are easy to download. Hi! Thank you for sharing this template using a blogspot format. I've been using this for my blog already. Just one concern though. The DATE in my posts does not reflect and only the time. Is there a code or setting that I can include so that it shows the date when the entry was posted? Hope you can help me out on this one. How to change the latest R4i SDHC V1.4.3 themes and skins with 3 steps? R4i SDHC V1.4.3 from r4i-sdhc.com is a most attractive flashcard for Nintendo DS and DSi V1.4.1,V1.4.2 and the latest V1.4.3. It was hot on 2011. And now, R4i-sdhc team upgrade R4i SDHC card to V1.4.3 for latest DSi V1.4.3 firmware. It is said, more than half of DSi users choose r4i sdhc V1.4.1 card to enjoy games and multi-media. However, may of these users may don’t know how to change or DIY the skin of R4i SDHC card. You should know some knowledge about R4i SDHC,The above accessories are need for r4i sdhc kernel installation and skin change. Thank you for your analysis and sharing, from your article I learned more. WP sora is the nice and more interesting blogger shared on the site so that can be enjoy it. Mostly people are very like it and entertainment in this post. Nice post.I like the way you start and then conclude your thoughts. Thanks for this information .I really appreciate your work, keep it up. In this blogger so very nice and good template shared on the site so that can be enjoy it in this blogger. Those people are very like it and enjoy it in this blogger.